Beyer Carpet Cleaning loves dirty carpets. Beyer Carpet Cleaning can get out those seemingly impossible stains. From red stains to wax, oil, ink, and other dyes Beyer has a solution to get those out and if they cannot then they don’t charge you. If your children are anything like the Beyer family they love to get into anything that is in arms reach. The Beyer’s have had dink spills, food spills, paint, marker, ice cream, and pretty much everything else in their carpets. Every time they have used one of their own technicians to clean their carpets just like that the stains are gone. Even stains in their mattress from drink, soiling, and food have been treated and disappeared. Stains on their sofas like pen, soiling, food, and drinks as well have come out using their solvent solutions and steam clean. You name their children have made some kind of mess with it and have been able to get it by using one of their pros to clean it. Trust the Beyer Family when they say it’s easier to clean a child’s mess by using a pro rather than trying to do it yourself. Children can be messy and cause messes that require a good cleaning. So whether it’s carpet cleaning, upholstery cleaning, or tile and grout cleaning that you need call Beyer Carpet Cleaning. They can take care of all your cleaning needs. When the kids bring in mud and grass stains or spill food and drinks there is no need to stress. 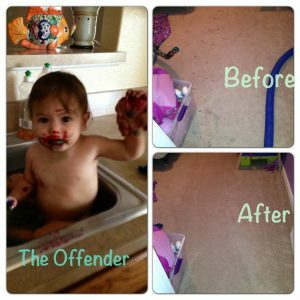 Your DIY cleaning products may not get out those stains by Beyer Carpet Cleaning will. With their truck mounted equipment and top of the line cleaning products they get out even the toughest stains. Call (210)723-4392 today and schedule your cleaning because at Beyer Carpet Cleaning “We Love Dirty Carpets”.